If there is anything that should make Americans' blood run cold about immigration, it is the sight of Europe—and Britain, the home of Western civilization—being buried by millions of Muslim colonists. Europe is just hoping against hope that Islam isn't going to explode into massive rioting (or worse), or impose total cultural Islamification. Major jihadist terror occurred in London (July 7, 2005, killing 52 and injuring 700) and in Madrid (March 11, 2004, killing 191 and injuring 1841). Yet cowardly politicians continue policies of appeasement, which hostile Muslims correctly apprise as the fatal weakness of a culture too pacified to defend itself. Some Europeans already accept the coming Eurabia. One Dutchman, mourning the future loss of Europe was quoted by Paul Belien as saying, "I am not a warrior, but who is? I have never learned to fight for my freedom. I was only good at enjoying it." Well, that's honest. But how about less self-pity and more directed anger? Many Americans I know in the patriotic immigration reform movement had a come-to-Jesus moment of awakening from passivity, turning to resolve to save the country. Did America encourage Europe's socialist pacifism by protecting it too well, starting after the Second World War? Perhaps. Having your freedom handed to you on a plate is no way to appreciate its value. Other causes of the continent's tragic downfall are rooted in recent history. They include business' desire for cheap labor (so familiar! ), a trendy belief in secular multiculturalism as a replacement for Christianity and apparent ignorance of Islam's long-standing enmity toward Europe. Now the triumphs of Tours and Vienna are being trampled by immigrants, entering mostly legally. It's a wonder the Muslims bother with terrorism at all when demography is working so well for them. Europe's swirl down the toilet bowl is little reported in this country largely because the Main Stream Media is not interested in showing it. The top media elites are still stuck on multiculturalism. But the European experience shows what a bogus ideology that is. "But nothing prepared France for what happened to a 17-year-old French Muslim girl named Sohane Benziane. Her case really woke up the country to the nightmare that has been festering so long in these projects. "Sohane was burned alive in the basement of an apartment complex by a gang leader who had told her that he didn't want to see her on his turf. After her murder, her sister, Kahina, dedicated a memorial at the site of her killing." Though emotionally searing, the Sixty Minutes piece contained no mention that France's Muslim population is expanding rapidly. The number of Muslims residing in Western Europe in 1900 is estimated at around 50,000 . Now France alone is home to somewhere between four and eight million followers of Islam. Just recently, five years later, Fox News has carried a televised report, Politicians Fret as Muslim Population Swells in Europe Amid Little Integration [March 24, 2009]. "Although there are no official statistics on how many Muslims live in Brussels, it is believed they make up about 25 percent of the city's 1 million urban residents. [Filip] Dewinter, who opposes immigration and has called Islamophobia a "duty," claims three of the 19 sections of Brussels, each with its own mayor, now have Muslim majorities. "Yet Molenbeek remains disconcerting. Belgian police assigned three plainclothes officers to watch over a FOX News team shooting street scenes one morning in Molenbeek. When FOX News returned in the afternoon as more people were out and about, the police said it would be safer not to get out of the car. It wasn't even dark yet." Notice this level of danger exists in Brussels—the supposed capital of the Europe Union. News icon Edward R. Murrow is remembered in particular for broadcasting from London during the blitz to warn America of the threat to civilization posed by Hitler. Had Murrow lived during our own time rather than WWII, he may well have tried to alert 21st century Americans to the present danger from totalitarian Islam on the march. But there is no modern Murrow to warn the people, because the MSM no longer does its job to inform about the pressing issues. In the eye of the slow-moving storm, resistance to the invader is not particularly strong. Denmark has stiffened its entry requirements to keep out the unfriendlies, but it is the exception and not the rule. Italy's education minister has suggested that a limit of 30 percent foreign students be the limit per classroom, so that the immigrants assimilate to the national culture rather than the other way around. Naturally, the economic downturn has made the majority of Europeans want the excess immigrants to go home, but many governments prefer not to upset Muslims, who are famously sensitive about the most minor slight. Americans often have a low opinion of Europeans, particularly the French (once described on The Simpsons as cheese-eating surrender monkeys, a rip that has stuck). But we hate to see Britain turn into a quivering bowl of sharia jello out of respect for our shared Anglophone culture. Who could have imagined that the countrymen of Winston Churchill would meekly acquiesce to recognizing and rewarding polygamy? Multi-wifed Muslim families even receive extra welfare benefits for the various harem members and kiddies—though bigamy is still illegal. There was an uproar last year when Archbishop Rowan Williams suggested that Islamic sharia should be accepted as part of British law. Sharia law—that's the Muslim legal system that decrees the second-class status of women, executions for homosexuals and amputations for theft. The Archbishop remains ensconced in Lambeth Palace, despite demands for his resignation during the sharia kerfuffle. In fact, weathering the crisis appears to have made him bolder. "On the anniversary of the interview in which Dr Rowan Williams said it 'seems inevitable' that some parts of sharia would be enshrined in this country's legal code, he claimed 'a number of fairly senior people' now take the same view. "He added that there is a 'drift of understanding' towards what he was saying, and that the public sees the difference between letting Muslim courts decide divorces and wills, and allowing them to rule on criminal cases and impose harsh punishments." [Archbishop of Canterbury: Society is coming round to my views on sharia, By Martin Beckford,, Daily Telegraph, Feb 15, 2009]. Is everyone assured that "harsh punishments" —flogging, amputations, etc.—will not occur at some future date? And whatever happened to the proud tradition of the Magna Carta? Is nothing worth defending? How shameful to surrender founding legal principles of centuries' duration so thoughtlessly to the Islamic interlopers. Britain is fascinating to observe because it is far advanced along the immigration road to hell, especially given its powerful multicultural nanny state. Plus, the extra helping of Muslims makes British cultural survival all the more challenging. The UK shows exactly what not to do in public policy—a combination of poorly chosen immigrants, the false ideology of multiculturalism and disempowerment (both physically and psychologically) by disarming the populace. Sadly there seems to be little organized opposition among the traditional folk against their new alien overlords. However, there are uprisings of appropriate anger on rare occasions. 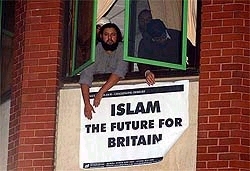 One such was the outrage of Luton residents toward Muslims insulting British soldiers returning from serving in Iraq. Local people of all ages simply wouldn't allow Muslims to abuse the troops and proceeded to chase off the obnoxious hecklers. [Watch.] It was brief demonstration that normal patriotism (and therefore hope) has not been completely repressed by the liberal thought police in Britain. But from this side of the pond, the UK looks like toast. In 30 years, London will likely be a sand-free version of Riyadh, with wall-to-wall burqas, and Saudi-style morality police in place of bobbies. Yet even with Europe's Technicolor demonstration that Muslim immigration equals cultural suicide, American elites and the press still cling to the dangerous fable that we are somehow immune from those troubles because America does assimilation better than Europeans. Perhaps we do in the area of employment opportunity. But that's not the point. We should instead be asking whether Muslim immigrants become loyal members of the US community—and many don't. A 2007 Pew poll found that only 28 percent thought of themselves as Americans first while 47 percent identified primarily as Muslims. Their loyalty lies abroad with the worldwide Muslim community (the ummah), which sees itself as being victimized by the West. But because of what Enoch Powell called "obstacles which are deeply rooted in human nature" when grappling with slow-moving threats, we snooze on, despite the throbbing neon message of doom. Muslim immigration to America is growing, but the overall number is still small as a proportion of population. But it's never too early to quit the habit. Clever analysts have noticed that when the percentage of Muslims in a non-Muslim culture reaches around 10 per cent, bad things happen. We are just as vulnerable to the actions of hostile Muslim immigrants as our fellow English-speakers across the Atlantic. But we still have the blessing of time. We could come to regret ignoring Europe's experience by allowing numbers of Islamists here to reach critical mass. Even a handful of determined jihadists can kill thousands, as we learned on 9/11. We must realize as a nation that there's no right to immigrate—and we are foolish to welcome possible enemies. Brenda Walker (email her) lives in Northern California and publishes two websites, LimitsToGrowth.org and ImmigrationsHumanCost.org. She's still looking for the Mythical Moderate Muslim.